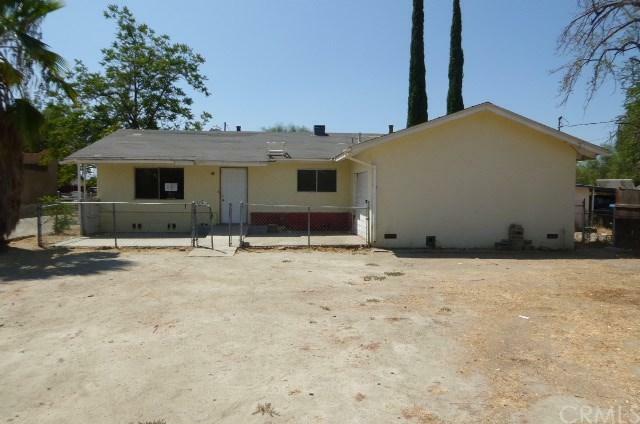 **HUD HOME** PRICED REDUCED **Back on the market** Located in the heart of San Jacinto. HUGE opportunity to own a single story home with a large fenced in lot. Featuring 4 bed / 2 bath on a raised foundation with living room, dining room, kitchen, no HOA fees! 1 car attached garage. Great potential! Make an offer and make this your home today! Property is NOT located in a FEMA Special Flood Hazard Area but is listed as a moderate to low flood risk. Please refer to website for additional information regarding flood zones and insurance, State law requires Carbon Monoxide detectors be installed for properties having combustible fuel heaters/furnaces, fireplaces, hot water heaters, clothes dryers, cooking appliances, or an attached garage, but seller (HUD) is exempt from this requirement as a Federal Entity, Water meter is missing. It will be the buyer's responsibility to pay any fee or cost associated with replacing the water meter or repairing the system if needed. Repairs: Roof is near the end of its useful life, replacement is recommended, Replace PVR pipe, shower head, tub, plumbing fixtures, water heater and straps, Repair-secure electrical wires, Thermostats and A/C unit are missing, Replace garage and interior doors. Install smoke and CO detectors. Built in 1963 LBP. Listing provided courtesy of Nat Genis of The Nat Genis Team, INC.